Complete control in one easy to use system. 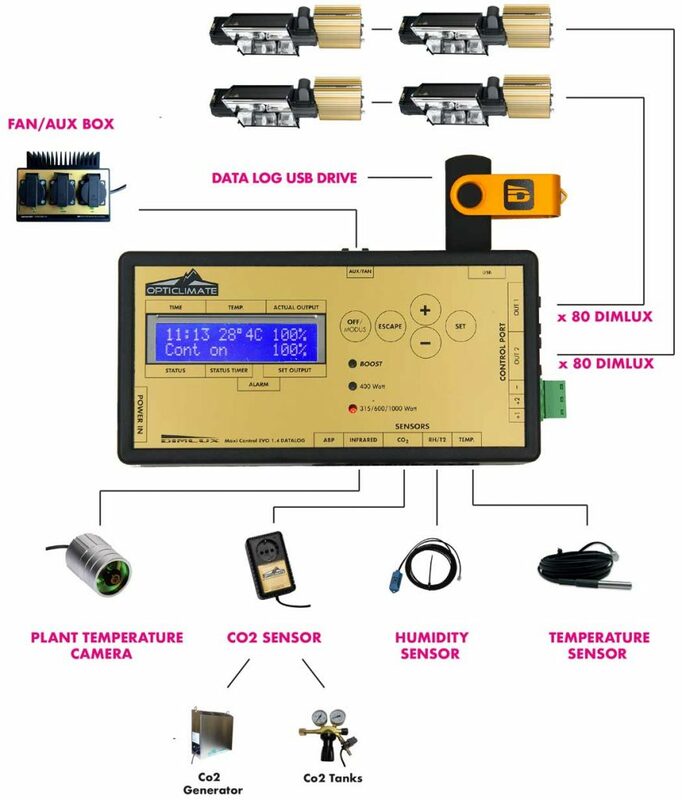 To copy the natural habitat of plants as well as possible, the DimLux Maxi Controller offers the possibility to simulate sunrise and sunset. In this process, the connected DimLux Expert Light systems are slowly switched on and off. Plants do not make use of photosynthesis until a certain temperature is reached, if the lights are fully turned on after a dark period, this can be stressful and influence the growth. This can be prevented by simulating sunrise and sunset, and moreover, it saves energy. Another disadvantage of switching from a cold to a warm room and vice versa is condensation. Water drops on plants can’t be absorbed, and evidently this is a (big) problem as botrytis (rotting) may develop. This can be prevented by simulating sunrise and sunset. Using the DimLux lights with a Maxi Controller enables you to plug the DimLux directly into a wall socket without needing an intervening relay, time delay unit or time switch –which saves you costs. A DimLux controlled by a Maxi Controller is the only (digital) ballast that does not need to use an inrush current. Inrush currents of conventional (digital) ballasts vary between 50 and 160 Amp, while newer types of digital ballasts use soft-start technology that limits the inrush current to between 50 and 60 Amp –which is still an appreciable current, especially when multiplied by the number of (digital) ballasts incorporated in the circuit. All DimLux ballasts are controlled by 1 Maxi Controller, so all DimLux ballasts dim at the same time, a feature that is particularly convenient with newly-planted crops: the light output can, for example, can be increased in 10% increments on successive days. A maximum of 160 DimLux ballasts can be connected to 1 Maxi Controller. 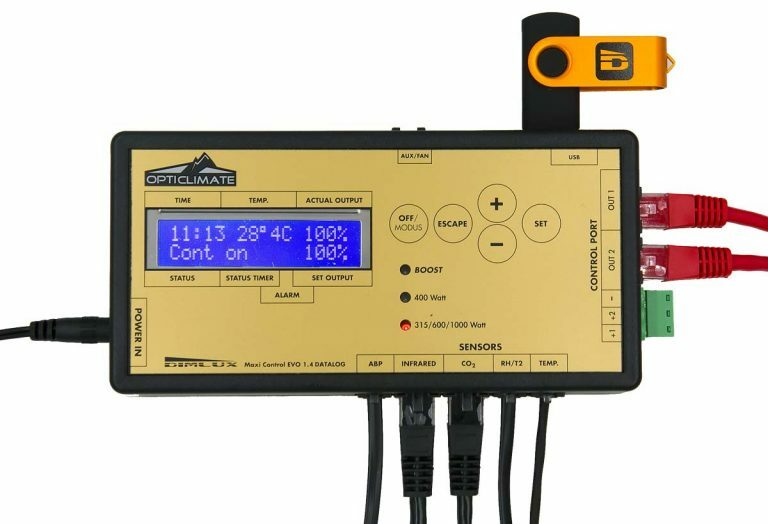 The Maxi Controller can adjust the output according to the ambient temperature: the lamps are dimmed automatically when the temperature exceeds a maximum predefined level. DimLux ballasts used in combination with an OptiClimate Maxi Controller also offer many other functions and options.